Following my previous post on Messier 36, a simple 2 degree slew of the telescope and I was centered on Messier 38 (NGC1912). This open cluster measures 21 light years across ( 21′ apparent) or twice the size of M36. It is also much older than M36 which is why you’ll find less hot blue stars within the group if you compare with M36. 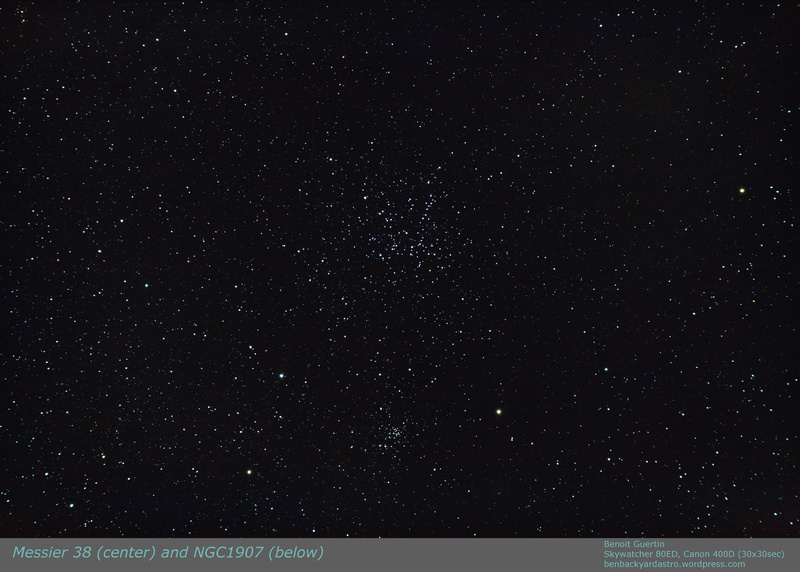 Just half a degree below is an older and smaller open cluster NGC1907. While some have speculated that they are locked together (a binary cluster?) this cluster is 500 million years old, almost twice the age of M38, hence were formed at different periods and most likely from different molecular gas. This is just a chanced fly-by with no interactions. This entry was posted in Photo and tagged Astronomy, Astrophoto, Astrophotography, Messier, Open Cluster by Benoit Guertin. Bookmark the permalink.